Our family love staying at Cartref, light and airy with big views, balcony off the kitchen, BBQ watching the sun go down or a short walk to town with its many wonderful restaurants, live music and clubs.... so much to do... Queenstown is the ultimate is a holiday destination, whether bungi jumping, mountain biking and jet boating are you thing or chilling with a book and a wine on the deck, there is something for everyone - all year round, young and old. Whereas it is a house for groups and it is a fun house in a fun place. It is not a house for partying all night in as it is in a residential area with neighbours who work 24/7. So we ask that you respect this and keep noise down after 10pm. Pets and children are welcome however the property is not fully fenced so they need to be monitored. Downtown Queenstown 1.5 k walk down the hill. House is just above the central hotels in a residential street, a 12 minute walk to town, 10 dollar cab ride if you prefer. 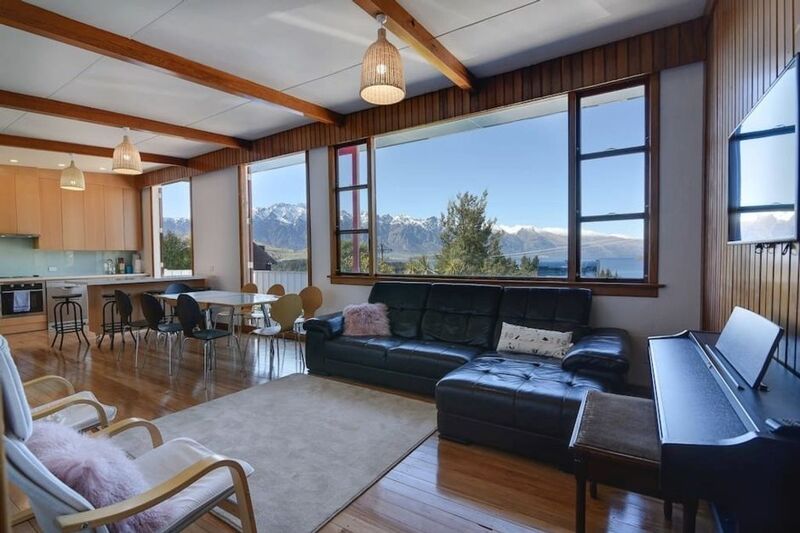 The house has a great view out over Queenstown and is only a 10 minute walk into town or a short taxi ride. We had 8 golfers staying there and all found the house to be very comfortable and well equipped and presented. Would definitely 100% stay there again. Many thanks Nicky. Great place to stay. Nice and clean. Modern kitchen and bathrooms. Comfy beds. Pleasant walk into central Queenstown. Property was wonderful a very great house had everything we needed. Very close to the lake. Just wonderful!! Perfectly located, safe, comfortable awesome to deal with! Close to the centre but away from the hustle and bustle. An enjoyable picturesque walk down to town centre or a short cab ride if you prefer.